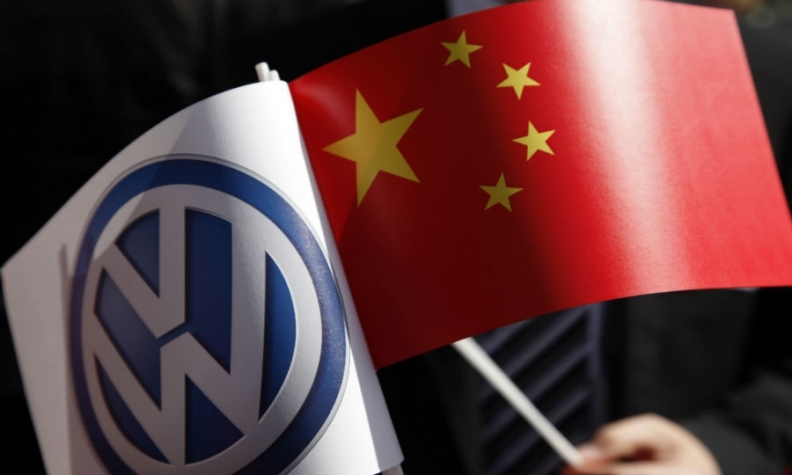 SHANGHAI (Reuters) -- Volkswagen Group's lead in China's compact-sedan market this year has helped a handful of German marques sell almost as many passenger cars as China's 25 local brands combined -- a trend industry watchers say can only lead to consolidation. Competitive pricing has made four Volkswagen models China's best-selling compacts, boosting Germany's share of the overall passenger market to 24 percent in July from 21 percent at the end of 2013. That's now just 6 percentage points shy of brands from Geely Automobile Holdings, Great Wall Motor, BYD Co. and other Chinese automakers, according to wholesale data from the China Passenger Car Association (CPCA). The diverging fortunes coincide with a government drive to stifle extravagance among civil servants, which has led to slowing sales of luxury foreign cars and broadening ranges of affordable, high-quality models. "European brands, especially Volkswagen, have been ferocious in winning market share," said Yale Zhang, managing director of researcher Automotive Foresight. "Chinese brands' biggest woe is losing ground in the compact segment because of the onslaught." Volkswagen sold 667,688 New Lavida, New Santana and Sagitar compact sedans in China in the first seven months of the year, according to researcher LMC Automotive. That compared with the 147,651 vehicle total of the top three local models -- Geely's Emgrand EC7, Great Wall's Voleex C30 and BYD's Surui. Compact cars account for about 60 percent of passenger vehicle sales in the world's largest auto market, where consumer purchasing power is rising in tandem with rapid economic growth. The segment expanded 15 percent in January-July versus industry growth of 8 percent, CPCA figures show. "Most Chinese brands won't survive," said analyst Benjamin Lo at Nomura International. Brands from privately run makers such as Geely and Great Wall are most likely to survive because those companies have good management, Lo said. The market shares of Japanese, U.S. and Korean makers were flat in January-July. In contrast, German manufacturers -- and Volkswagen in particular -- have gained by almost matching local brands' prices and because of a reputation for high quality. Volkswagen launched its New Santana two years ago with a starting price of 84,900 yuan ($13,824), only slightly more than the EC7's 70,000 yuan. "People say German cars are of good quality," said Zhang Lei, a 35-year-old office worker in Beijing who bought a New Santana last year. "Why not buy a German car if it's not expensive?" Sales of the New Santana more than doubled in January-July, whereas those of the EC7 and Surui fell 30 percent and 40 percent respectively, according to LMC Automotive. Sales of the Voleex C30 more than halved. J.D. Power last month found only 16 percent of prospective car buyers in China would choose a domestic brand, compared with 27 percent a year earlier. The California-based research firm attributed the change to foreign carmakers targeting less wealthy customers with brands that are "stronger" than those of local counterparts. "Chinese brands are cannibalizing each other," said Dong Yang, secretary general of the China Association of Automobile Manufacturers. "They need more cooperation and consolidation."